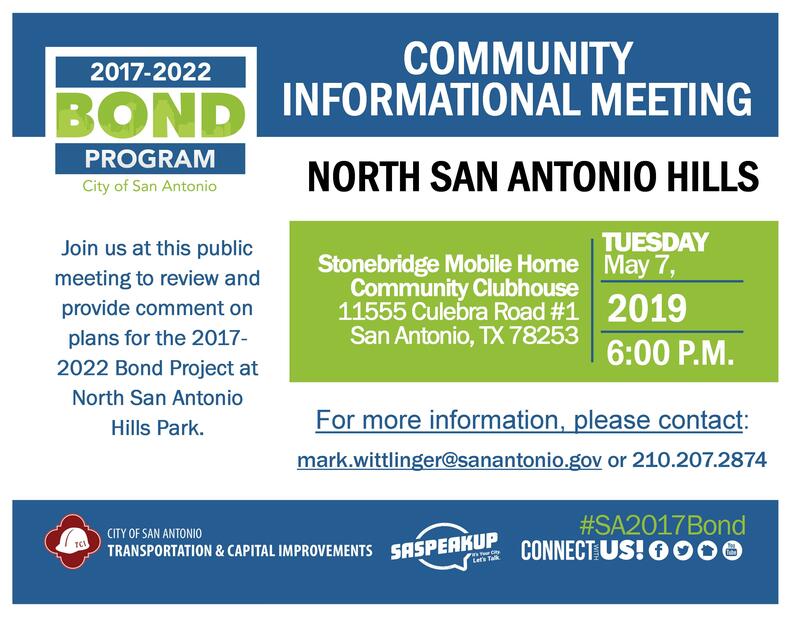 Review & comment on plans for North San Antonio Hills Park in District 6! The Bond will build over 200 miles of new sidewalks. The Bond will improve 25% of our City's parks! Dedicates 70% of funding to drainage & street projects! Building and improving libraries & public service facilities. Improving communities in San Antonio. Looking for small, minority or women-owned businesses. Tell us what improvements you would like see in your community! On May 6, 2017, the San Antonio public approved six propositions for the City’s 2017-2022 Bond Program totaling $850 million and including 180 projects. With voter approval, TCI is ready to get to work with the design and construction industry to deliver the street, drainage, parks and facility projects. As part of the mass selection of design consultants for the 2017-2022 Bond Program, 107 contracts estimated at $58 million were approved by City Council to move forward onto the design phase. The contracts included 48 streets and drainage, 14 buildings, and 45 park related projects. The City's utilization of local small, minority, and women-owned businesses, surpassed previous results achieved during the 2012 Bond mass selection process. 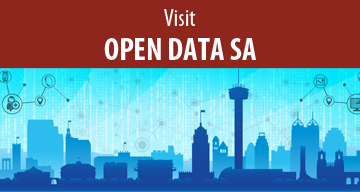 In total, 74 unique prime consultants were selected for award by City Council, of which 97 percent firms are located within the San Antonio Metropolitan Statistical Area. Of the design dollars awarded to local small, minority and women-owned businesses, 65% is estimated to be paid to small businesses, of which 50% will go to small businesses who are also minority or women-owned. Increases from the 2012 Bond mass selection process were realized in all prime categories. There is a 4% or $13.8 million increase in awards to small businesses, a 3% or $10.8 million increase to minority and women-owned businesses, and a 2% or $1.5 million increase in awards to African-American businesses. The 2017 Bond Program was developed with an extensive Public Input Process. From October to December 2016, 160 residents comprising five Community Bond Committees appointed by the Mayor and City Council Members met to review and discuss initial staff recommended projects. The meetings provided citizens an opportunity to provide suggestions for projects. There were 30 meetings held including five tours. More than 1,400 residents were in attendance at these meetings and 350 resident comments were made. The Community Bond Committees recommendations were presented to the City Council on Wednesday, January 11, 2017, and the City Council approved more than 94% of the Committee's recommendations for inclusion. The City Bond Oversight Commission (CBOC) is comprised of 15 members appointed by the City Council. Appointments are made to ensure a diverse representation from each of the respective districts. The Commission is comprised of: One (1) Commission Chair appointed by the Mayor; One (1) Vice-Chair appointed by the Mayor; Three (3) individuals appointed from and representing the Parks & Recreation Board, The San Antonio Public Library Board, and the Bexar Regional Watershed Management Committee Appointed by the Mayor; and Ten (10) individuals representing the ten City Council districts with one appointed by each City Council member. The Commission will meet on a quarterly basis to review the progress of the 2017 Bond Program and provide an annual report to be presented to City Council. The Source: How Could The 2017 Bond Package Reshape San Antonio's Future? City of San Antonio City Manager, Sheryl Sculley, talks to The Source about the proposed 2017 Bond and how it can help reshape San Antonio’s future. In a recent San Antonio Express-News article written by David Hendricks, the City of San Antonio was recognized for having a AAA bond rating. In a recent Texas Public Radio interview, City officials talk about Neighborhood Improvements as part of the proposed 2017 Bond Program. News releases pertaining to 2017-2022 Bond Program.